There's a funny article in my paper this morning listing newspaper headlines unlikely ever to be seen. You need to subscribe to The Daily Mash. "Charles Plays with Willie in the Bath". Probe reveals politician honest and kind. Trump voted in for a second term. Damn you Dave. Parrish the thought. I know Putin is trying to figure out how he will do it next time. Howard Schultz gives away his fortune because no one will call him a "person of means" instead of a billionaire. Shane McBride Wins Nobel Prize For Literature And Canadian Award For Sobriety! Don Jr. proven to be smarter than a bag of hammers. "God: I believe in Dawkins"
Some time in the early/mid 1980s Queen Eliz II was traveling in South America and was served up something not on her approved list. One of the British Tabloids had a front page photo of her wrinkling her nose with a headline, "Queen Eats Rat". Donovan says 'the Beatles would have made it without my help, and I modelled myself on Dylan'. Brexit settled to everyone's satisfaction. Mudcat users agree to agree. If I sing in the shower, and nobody hears me,am I just miming? If I sing faster than the speed of sound,can I harmonize with myself? If I walk down the street,but nobody sees me,am I invisible? David when you're Wright you're right. Hahaha Tattie! About time too! I think I recently read that the police had stated that the theft of several hundred sheep was planned. It's difficult to imagine the logistics involved in shifting that many animals would not have a plan. Hahaha Jon! True, no-one could say they were passing a field and on a sudden whim decided to open the gate and get their sheepdog to herd them into a passing sheep lorry! 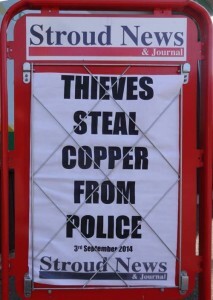 "Thieves steal copper from police"
Another drift but an odd one we reported to the police was pigs on the road. Not what you'd want to meet on the A140 but there is a certain awkwardness about reporting it. A friend of mine many years ago got a job working for The Wichita Eagle writing headlines. He'd be given raw copy in printed form (before computers) and would type a headline, clip it to the story, and hand it to the editor for approval. The editor would (usually) toss it on a moving belt running into the composing room where it would be set in type. Sometimes the editor would make corrections or give it back to be "tightened up". My friend Tony got a general request to 'make heads more succinct, but clear & to the point'. One day Tony got a brief story about a man who was tried & convicted of "indecent exposure". He pondered... then wrote 2 versions... and handed #1 to the editor, who glanced at it, tossed it on the moving belt.... then made a frantic leap to barely grab it before it disappeared thru the wall. He looked at Tony with mouth open as Tony said.."Oh, here's your real head.."
The original said "Dangling dong dooms defendant." Pwaaaaaahaaaahaaagh Bill!!! Dangling dong!!! I must remember that the next time my husband emerges from the shower in the altogether! hee hee! Did it have a luminous nose? Hahahaaaaaaagh Mrzzy!!!! He may wander over 'the great Gromboolian Plain' with his Dong, but I can't vouch for its nose being luminous. I wonder if the headline "Theft of bathroom fittings. Police have nothing to go on" is apocryphal / accidental / or a jpurnalist with a sense if humour. Strip Search Finds Crack Between Buttocks. Greek immigrant not to be prosecuted after lengthy plea bargaining. ITV runs programme on elderly drivers and when to give up. Police to act on indecent shows.